Woodford Community Centre is a licensed venue for civil ceremonies making weddings at Woodford memorable events. The Small Hall can be set up for your civil ceremony and then you and your guests move through to the Large Hall for the celebrations. The Small Hall sits approximately 70 people for a civil ceremony. 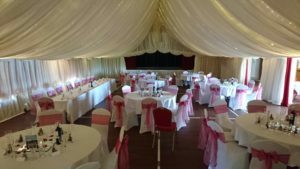 If more space were needed, an alternative would be to use the Large Hall for the ceremony with your guests sitting at round tables and either move through to a marquee on the field for the celebrations or remain in the Large Hall. 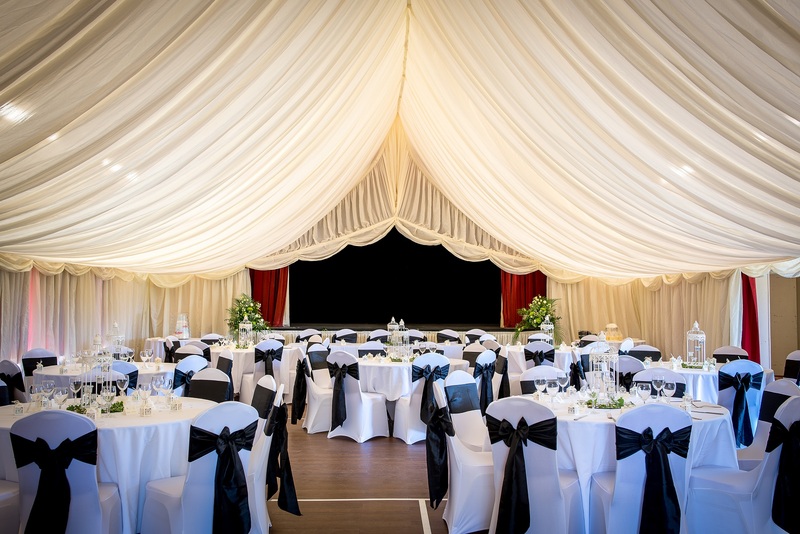 The Large Hall can be decked out with marquee linings which provides a complete transformation. The Large Hall will be available from 2pm on the Friday afternoon so that you may dress the hall. The whole Centre is available from 8am Saturday morning through to Sunday lunchtime. If you would like to get an idea of availability and how it all works please take two minutes to complete our preliminary wedding enquiry form and we will get back to you asap. 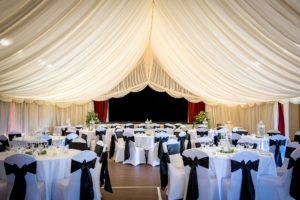 An outline guide to costs are as follows: Basic Hire £700, Basic hire but with the Large Hall lined out in marquee linings £850 (installation and hire of marquee linings is in addition to the £850), Hire of Centre with marquee / teepee on the field £1000. As stated, these are outline costs, you may require other facilities which would incur additional charges so do please contact us before taking it as gospel that your event will cost exactly one of the three prices outlined above.Thank you. Once you have made a firm decision to go ahead at WWMCC please complete our Wedding booking form – in order to secure your celebration in our diary. As we say on the form, we appreciate that you will not have all the information to begin with but that doesn’t matter initially. What does matter is that you complete the form in the first instance. Thank you, we look forward to hearing from you. Height Restriction Barrier please note that our premises are protected by a height restriction barrier and WWMCC needs to be informed of any suppliers to your event that may be affected by this, of their delivery / arrival times in order that we may lift the barrier.